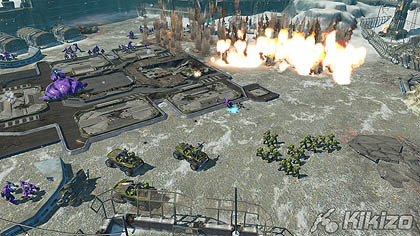 Devine is confident that Halo Wars is free of the control issues that belabour certain of its console RTS peers: Ensemble has, after all, built the game from the ground up for the Xbox 360. "One of the first things we did on the game was to spend the first year working on those controls. We took Age of Mythology and, before there was any Halo IP or any IP at all, just took away all the on-screen controls and all of the interface and the U-shaped thing that's at the bottom of every RTS game because it must be there, and the big line across the top because it must be there and so forth - we took all of that out, and just thought about what we wanted to do with the controls in a strategy game. "And we started to think about the actions that we wanted to do - I want to control a unit, I want to control an army, I want to move a unit, I want to move an army - and not actually thinking about porting the PC experience, so click "select" then right-click to move or left-click to move or whatever click it is to move, not thinking about left-clicking or right-clicking or shift-clicking or whatever you do in a PC strategy game. So we tried to actually think about the end result... then we started to get successful with the actual controls." Ensemble's answer to relatively limited input options and imprecise analog stick movement is a hearty brew of context sensitivity and shortcuts. Hold your cursor over a unit and tap A to select it; double-tap to select all units of that type; hold the button down and the cursor will expand to cover a small group. X is used for movement and attack orders, and hitting Y while targeting an enemy building or unit unleashes a secondary power. Clicking a bumper selects all the units on a screen, B deselects a unit and the D-pad can be used to zip between selected forces and your base. Clicking on a building, finally, unfurls a series of easy-to-read radial menus with unit creation and upgrade options. Everything proves functional enough under the pressure of some ferocious initial encounters, our straggling force of grenade-launching Warthogs, flamethrower-equipped Marines and Scorpion tanks putting paid to battalions of Grunts, four-legged "building killer" Locusts and back-stabbing Jackals. We certainly aren't talking about a design revolution here, but the idea is presumably less to shatter any conceptual ceilings as to court the petulant Halo faithful with quietly serviceable basics, before pitching them into the heavy stuff. As Devine puts it, "We'll teach you combat really slowly so you won't even know you're doing something complex." 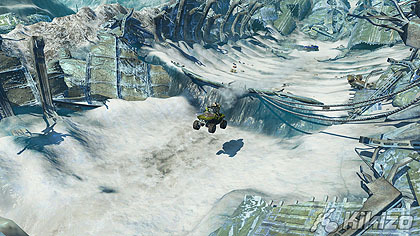 The sternest judges, however, may not be the fans but Bungie themselves, to whom Ensemble's designers often deferred while thinking up the control scheme. "The finish line would be when they were convinced that the game is more controllable with a controller than it is with mouse and keyboard," Devine tells us. "We had a direct comparison because of Age of Mythology - there was a keyboard and mouse engine right there, and here's a completely redone version with a controller. In the end they were of the opinion that it was easier with a controller. So we felt we did well there." For our part, we're reserving judgement. Ensemble's is an unenviable task: creating something that looks, sounds and handles enough like Halo to seduce the franchise faithful, while aiming at quite another kettle of gameplay fish entirely. Ultimately, the developer's swansong may hold too regressively to the Age formula to survive the harsh air of 2008, but if we're lucky, Devine and co will prove that this franchise lends itself to more than one archetype, that the award-winning Bungie blend of AI, level design and weapon-balancing can do for real-time strategy what it did for first-person shooting. It's worth remembering, of course, that Combat Evolved was originally a desktop strategy project. Will Halo Wars mark the triumphant closing of the circle? Halo Wars is slated for release exclusively Xbox 360 worldwide next February. 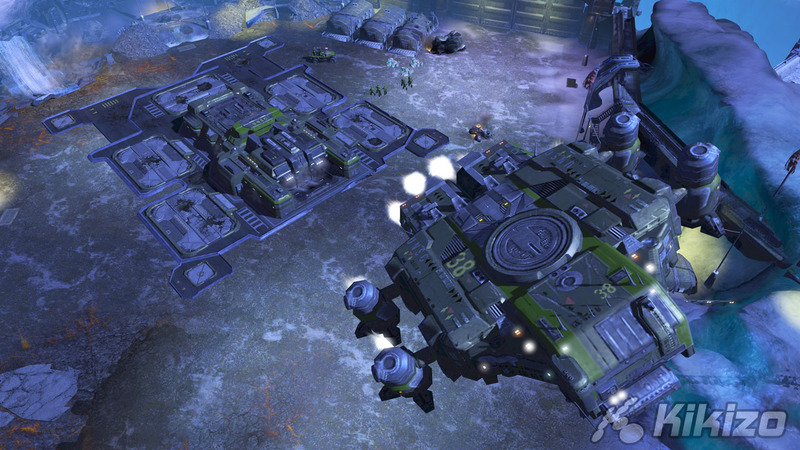 Check out our previous Halo Wars interview with Harter Ryan here.